I only know this originally Hungarian cake in its Viennese form. In Vienna, it is made from two thin layers of chocolate cake with a whipped chocolate cream filling and a shiny chocolate glaze—definitely a dessert for an important party. The good news is that it can be made entirely in advance. Do wait to cut it shortly before serving, however, or the cake layers will dry out. For the cake batter, put the 6 yolks in the bowl of an electric mixer and whisk in 1/4 cup of the sugar by hand. Place the bowl on the mixer fitted with the whisk attachment and whip the mixture on medium-high speed until the yolks and sugar are light and thickened. If you only have one mixer bowl and whisk, scrape the yolk mixture into a medium mixing bowl. Wash the bowl and whisk in hot, soapy water, rinse and dry them. Put the 6 egg whites and salt in a clean dry mixer bowl. Place on the mixer with the whisk attachment and whip the whites on medium speed until they are very white, opaque, and beginning to hold a very soft peak. Increase the speed to medium-high and whip in the remaining 1/4 cup sugar in a stream. Continue whipping the whites until they hold a firm peak. Stir the chocolate into the yolk mixture, immediately followed by about 1/4 of the whipped egg whites. Sift over and fold in the flour, and then fold in the remaining egg whites. Scrape the batter onto the prepared pan and use a medium offset spatula to spread the batter evenly. Bake the cake layer until it is risen (it will not rise very high) and firm when pressed with a fingertip, about 15 to 20 minutes . Slide the paper from the pan to a rack to cool the cake. For the filling, bring the cream and corn syrup to a boil in a large saucepan, stirring occasionally to make sure the corn syrup doesn’t fall to the bottom and burn. Remove the pan from the heat and add the butter and chocolate. Gently shake the pan to make sure the butter and chocolate are completely submerged and wait 2 minutes for them to melt. Whisk the filling smooth and pour it into a bowl. Refrigerate the filling until it is about 80 degrees, or until it is of spreading consistency. Don’t leave the filling in the refrigerator indefinitely, or it will become too hard to whip. Scrape the cooled filling into the bowl of an electric mixer and beat it with the paddle on medium speed until it is lightened to a milk chocolate color. Don’t overbeat, or the filling will separate. Immediately use a medium offset spatula to spread the whipped filling evenly over the cake layer on the cutting board. Invert the remaining cake layer, still stuck to the paper for easy handling, to a cookie sheet with no sides or to a stiff rectangular piece of cardboard. Gently slide the cake layer into place over the filling. Carefully peel off the paper. Place a stiff cardboard or cookie sheet on the cake and gently press to make sure the top layer of cake adheres well to the filling. Refrigerate the cake while preparing the glaze. For the glaze, bring the cream and corn syrup to a simmer in a medium saucepan, stirring occasionally. Remove the pan from the heat and add the chocolate. Gently shake the pan to make sure all the chocolate is submerged and wait 2 minutes for it to melt. Whisk the glaze just until smooth, but avoid whisking too much or the glaze will be riddled with bubbles. Let the glaze cool until it is just slightly warm to the touch, about 100 to 105 degrees. After the glaze has cooled, remove the cake from the refrigerator and pour the glaze over it. Quickly spread the glaze evenly with a medium offset spatula. Don’t worry about any glaze that drips down the sides of the cake, as it will be trimmed away later on. 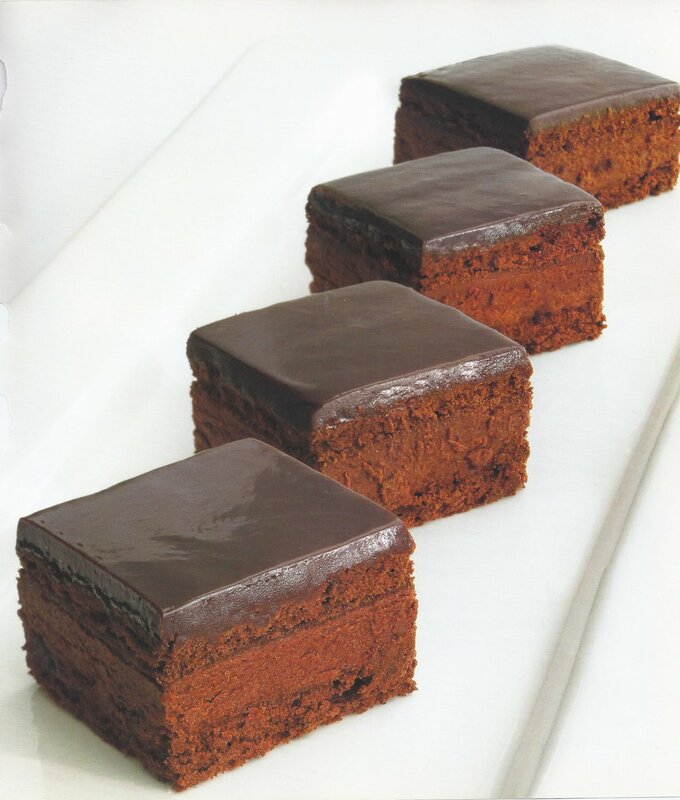 Refrigerate the cake again for at least 1 hour, or until a short time before you intend to serve it, to set the glaze. Glaze the cake on the same day you intend to serve it for maximum sheen. Rinse a long, sharp serrated knife in hot water, then wipe it clean with a cloth. Use the knife to trim the sides of the cake evenly, rinsing and wiping between each cut. Cut the cake into 2-inch squares. Serving: Lift the cubes of cake off the paper with an offset cake server or spatula and line them up symmetrically on a platter. Serve alone or with a little unsweetened whipped cream. Storage: Keep the cake refrigerated, but bring it to room temperature for an hour or so, depending on the room temperature, before serving. Cover leftovers with plastic wrap and refrigerate. Bring to room temperature again before serving.